Top TV personality and fitness role model, Lorraine Kelly, is backing Muscular Dystrophy charity, the Muscle Help Foundation (MHF)’s latest ‘get fit and give back’ campaign. The campaign, entitled #fitforafiver and launching today, urges people across the nation to ‘lose a few pounds and get #fitforafiver’. Once participants have located a fitness centre near to them that is taking part in this initiative, they can then donate £5 online via the charity’s dedicated #fitforafiver campaign page and attend the session, knowing that they are getting fit and giving back at the same time! Several gym and fitness partner organisations have already signed up, including Xercise4less who have 35 clubs with over 250,000 active members. The Muscle Help Foundation (MHF) is an award-winning, niche family charity that delivers life-changing, highly personalised experiences, known as ‘Muscle Dreams’, for children and young people in the UK with Muscular Dystrophy (MD) and allied neuromuscular conditions. The charity aims to deliver 657 Muscle Dreams, the total number of muscles in the human body. 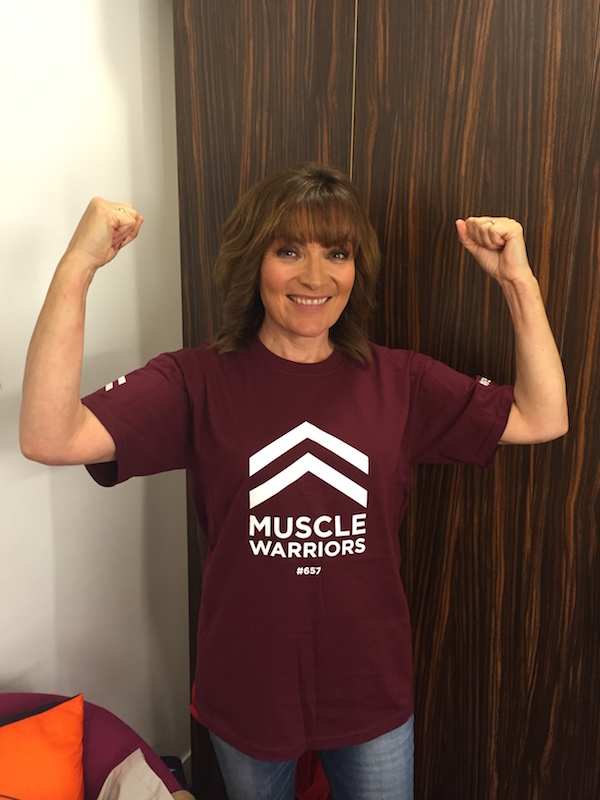 Lorraine Kelly, a patron of MHF, (pictured above doing the ‘Muscle Warrior salute’) said: “I’m a huge fan of staying fit, eating healthily and having confidence in your body whatever your age, shape or size. Therefore, I’m right behind The Muscle Help Foundation’s #fitforafiver campaign which not only encourages everybody to participate in a fitness class but will raise much-needed funds for this amazing cause. Be the first to comment on "Lorraine Kelly endorses Muscular Dystrophy charity’s #fitforafiver national fitness campaign"